Will Trump’s supporters notice the greedy excesses of a top campaign hire? But now Trump has tapped Steve Mnuchin, a 53-year-old Wall Street hedge fund and banking mogul, to be his campaign’s national finance chair. Trump’s earlier rhetoric aside, it’s actually a good match. Mnuchin is CEO of Dune Capital Management, a hedge fund has had business dealings with Trump. Both Trump and Mnuchin earned their first fortunes the old fashion way: they inherited it. Trump took over his father Fred’s real estate empire and expanded it through questionable business practices. 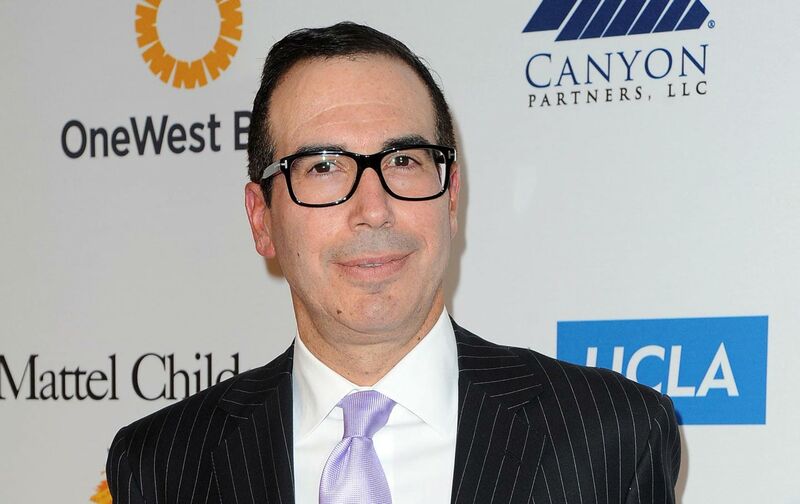 Mnuchin, also the scion of a wealthy and well-connected family, graduated from Yale in 1985 and soon wound up working at Goldman Sachs, where his father Robert had been a general partner. Both Trump and Mnuchin have run businesses accused of widespread racial discrimination, and they both represent the excessive wealth and greed of the billionaire developer and banker class. And both men have hedged their political bets, donating big bucks to Democrats as well as Republicans. Mnuchin worked at Goldman Sachs for seventeen years, where he eventually became an executive vice president. According to the Wall Street Journal, he left in 2002 “at the age of 39 with a reported $46 million stake in the bank.” He was recruited by his Yale roommate, Eddie Lampert, to join ESL, a hedge fund, as vice chairman. A few months later, he jumped to SFM Capital Management as its CEO. But within a few months he changed jobs again, leaving SFM to co-found Dune Capital with his former Goldman colleagues Daniel Neidich and Chip Seelig. In 2009, Mnuchin helped assemble a group of investors (including computer capitalist Michael Dell, financier George Soros, private equity investor Christopher Flowers, and hedge fund titan John Paulson) to buy IndyMac Bank from the Federal Deposit Insurance Corporation (FDIC) as part of a sweetheart deal. They renamed it OneWest Bank and kept its headquarters in Pasadena. FDIC had taken over IndyMac in July 2008. IndyMac was one of the largest lenders to collapse during the Wall Street-induced mortgage meltdown. It specialized in high-risk variable-rate mortgages and loans that didn’t require much documentation, including the income and credit history of borrowers. The Mnuchin group paid FDIC $1.5 billion for the bank, far less than the value of IndyMac’s assets. The FDIC was so desperate to unload IndyMac that Mnuchin and his colleagues were able to obtain, as part of the purchase deal, a so-called “shared loss” agreement from the FDIC which reimbursed these billionaires for much of their costs for foreclosing on people unlucky enough to have mortgages from IndyMac. Within a year, the group that the Los Angeles Times called a “billionaires’ club of private financiers” had paid themselves dividends of $1.57 billion. In other words, the FDIC took much of the risk by subsidizing the bank’s troubled assets, while Mnuchin and his colleagues pocketed the profits. The California Reinvestment Coalition—a nonprofit organization that pushes banks to reinvest in low income communities and communities of color—determined from Freedom of Information Requests that the FDIC had already paid out over $1 billion to reimburse OneWest for the cost of over 35,000 foreclosures in California and an unknown number in other states. CRC also estimated that the FDIC will eventually pay out another $1.4 billion for the costs associated with even more foreclosures in the future. OneWest opened its doors with 33 branches and roughly $16 billion in assets. Mnuchin engineered its growth by purchasing two other failed institutions—First Federal Bank of California and La Jolla Bank—getting the FDIC to agree again to additional “loss share” arrangements so that the owners had little to lose. After these purchases, OneWest had 73 retail branches and $26 billion in assets. It also serviced billions of dollars of mortgage loans on the behalf of third parties, such as Fannie Mae. In multiple surveys of California housing counselors, OneWest was ranked among the worst mortgage servicers in the state. OneWest also has a troublesome track record of foreclosures in communities of color. A CRC and Urban Strategies Council analysis of One West’s 35,877 foreclosures in California, from April 2009 to April 2015, found that 68 percent occurred in zip codes where the non-white population was 50 percent or greater. But foreclosures are where OneWest’s interest in those neighborhoods appears to end. Only two of OneWest’s 73 branches are located in low-income areas. It makes few small business loans to businesses with annual revenues under $1 million—the kind of operations common in low-income and minority areas. CRC executive director Paulina Gonzalez called OneWest Bank “a leader in foreclosing on seniors,” many of whom have reverse mortgages—loans that provide cash payments to help homeowners realize value from the equity in their homes, and become payable when the borrower dies or moves—insured by the Federal Housing Administration. Using another Freedom of Information Act request, CRC determined that OneWest’s reverse mortgage servicing subsidiary, Financial Freedom, was responsible for 39 percent of the foreclosures on FHA-insured reverse mortgages since April 2009. CRC estimates that Financial Freedom only services 17 percent of the reverse mortgage market. In other words, Financial Freedom is foreclosing on reverse mortgages at about twice the rate that one would expect, given their share of the market. Inevitably, these rapacious practices became the target of protest and public opposition. As I reported in the Huffington Post in 2011, OneWest tried to evict Rose Gudiel, a 35-year-old government employee, from her one-story house in La Puente, a working class suburb of Los Angeles. Guidel, her father (a warehouse worker), and her brother cared for her disabled mother in the small house they purchased in 2005. They made steady mortgage payments until 2009, when one of her brothers died unexpectedly and the family lost his income. The family was two weeks late on the next mortgage payment. The Gudiels then spent over a year attempting unsuccessfully to get the bank to modify the loan—even though their income had long since recovered after another brother moved in with them. Then the bank started foreclosure proceedings. But Gudiel said she would refuse to leave if the Los Angeles County Sheriff tried to evict them. She was joined by her neighbors, friends, and supporters from the Alliance of Californians for Community Empowerment (a community organizing group) and the Service Employees International Union. Gudiel and her allies organized a sit-in at OneWest’s Pasadena headquarters. In October 2011, in the midst of the Occupy Wall Street movement, Gudiel and over 200 supporters marched up the winding, hilly roads of Bel Air to the front gate of Mnuchin’s $27 million mansion, where they carried signs, blew whistles, and chanted in English and Spanish, demanding that Mnuchin and OneWest end the eviction proceedings and let Gudiel and family buy back their home. The protests garnered widespread media attention and forced OneWest to relent. OneWest and Fannie Mae authorized a loan modification that allowed the family to stay in their home. In July 2014, Mnuchin arranged to sell OneWest to the CIT Group for $3.4-billion—more than double what they paid for the bank five years earlier. CIT Group, a holding company that owned a Salt Lake City-based on-line bank, wanted to buy OneWest for its low-cost deposits and its network of Southern California retail branches. The consolidated bank now has assets of about $60 billion, ranking it among the nation’s 40 largest banks. The CRC led an unsuccessful campaign to thwart the merger unless the combined bank pledged to expand its investments in low-income and minority neighborhoods. Over 21,000 people signed petitions against the merger, and over 100 organizations joined the effort to stop it. This groundswell of opposition forced the Federal Reserve and the Office of the Comptroller of the Currency to hold a rare public hearing in February 2015. At the hearing, the CRC pointed out that, like OneWest, CIT Group is no stranger to corporate welfare. It pocketed $2.3 billion from US taxpayers through a Troubled Assets Relief Program bailout that the bank never paid back because it went bankrupt in 2009. Amazingly, CIT Group told its shareholders that it intends to use the bankruptcy to reduce its federal tax bill, thus cheating the taxpayers twice. Despite OneWest’s and CIT Group’s troubling track records, the Federal Reserve approved of the merger, while the OCC granted a “conditional approval,” and required the merged bank improve its draft plan to invest in under-served neighborhoods, as required by the federal Community Reinvestment Act. Nearly two years after the merger was first announced, however, “California communities are still waiting to hear about CIT Group’s reinvestment plan,” said CRC executive director Paulina Gonzalez. As part of the merger agreement, Mnuchin was given a seat on CIT Group’s board. CIT’s board infamously approved a change to its retirement policies to benefit John Thain, its departing CEO. Reuters estimates that change could be worth an extra $13 million for Thain despite the fact that, according to the Wall Street Journal, CIT Group’s board awarded John Thain only two points out of a possible 20 in its evaluation of his efforts to integrate the two banks. Under the terms of the acquisition, CIT agreed to pay Mnuchin $4.5 million a year for three years as the bank’s vice-chairman. Because he relinquished that post in March 31 of this year, Mnuchin was given a $10.9 million severance package, according to the Wall Street Journal. In CIT Group’s most recent annual report, the bank disclosed that it had received multiple subpoenas in 2015 from the Office of Inspector General at the federal Department of Housing and Urban Development (HUD) related to the servicing of reverse mortgages by Financial Freedom. Last year, Mnuchin resigned as co-chair of Relativity Media shortly before the Hollywood studio filed for bankruptcy. In a story in Variety, some creditors accused Mnuchin of having a conflict of interest because Relativity Media—which had received financing from OneWest Bank while he served as the bank’s chairman—repaid $50 million of those loans right before it went bankrupt. Like Trump, Mnuchin has showered politicians in both parties with donations, though in recent cycles most of his money went to Republicans. Mnuchin has also spread some of the wealth he earned from his government-subsidized banking fortune to a wide variety of charities. Before their 2014 divorce, Mnuchin and his wife Heather were stalwarts in the high-society world of philanthropy in both New York and Los Angeles, attending and hosting star-studded balls and parties to support their favorite causes.